We have very different snack habits the hubby and I: I can snack my way through a working day especially when I am feeling stressy, where as he gets the munchies in the evening when even a big meal can’t fill the calorie hole left by a gym workout. We’ve looked for healthier snacks to make ourselves but couldn’t find anything we agreed on: hummous is massively divisive in our home, I couldn’t sell the concept of energy balls and it was such hard work I may have resorted to chocolate! So it was a timely treat for us both when an Itsu eat beautiful box arrived promising healthier snacking inspiration for us both. The snacks were brilliant because we both found things which we really liked. Take seaweed thins. Now I love sushi and have no problem with the seaweed wrapped around my maki rolls. I don’t even mind a bit of Welshman’s Caviar sprinkled over a seafood dish at home. But try as I might I couldn’t get my brain to compute these seaweed thins as delicious snacks. To me they taste too sea-like! Andrew on the other hand was all over them. We tried the wasabi and lightly salted varieties and whilst they made me pull my comedy gross face that is usually reserved for olives, he was an immediate convert. 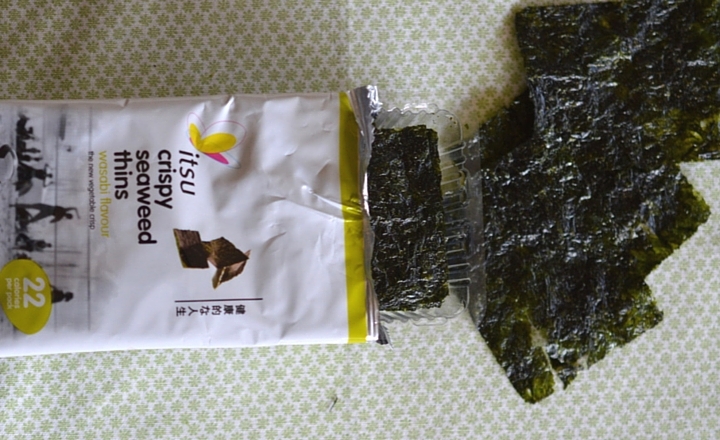 Weirdly, the wasabi version has more salt than the lighted salted (must be natural) but both are still super low and each packet is under 30 cals. I like my snacks sweet, so the Mango Mungo snack box was for me. The box tells me it has two servings in it, but the pieces are so naturally sweet (nothing added) and chewy that a couple of pieces were enough to see off a sugar craving. I work in a nut-free office which is a shame because a small serving of cashews or pistachios would always be a welcome snack for me, but I think this mango could find it’s way into my nine to five snackage arsenal. 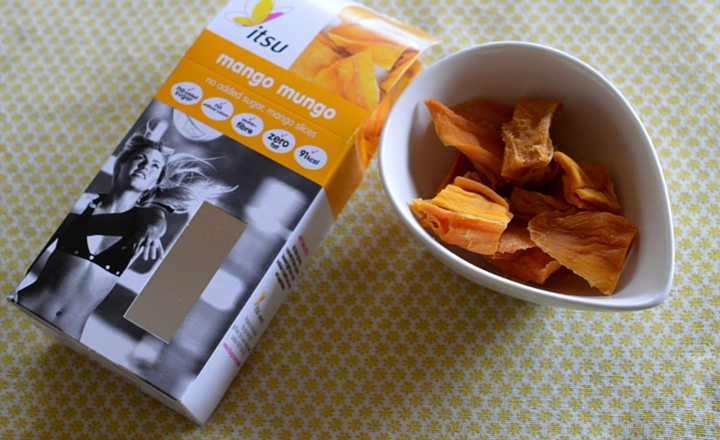 Itsu also do a pack of coconut chips which are ever so slightly salted. Again, these scored highly with Andrew whereas coconut leaves me cold. I was a bit shocked by just how quickly he ate them so I think we’d need to buy them in catering quantities! So far, so good. We’re not going to be fighting over anything! 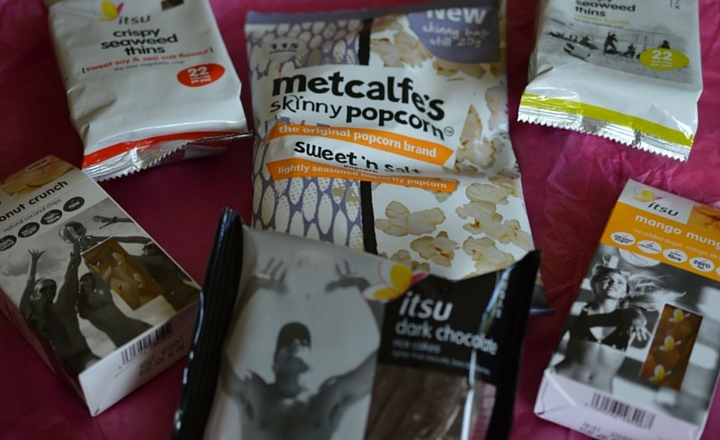 A packet of Metcalf’s Skinny Popcorn can often be found in my locker so I am pleased to see Itsu offering it as well. The sweet and salty is my favourite but the sweet cinnamon could be about to take over. 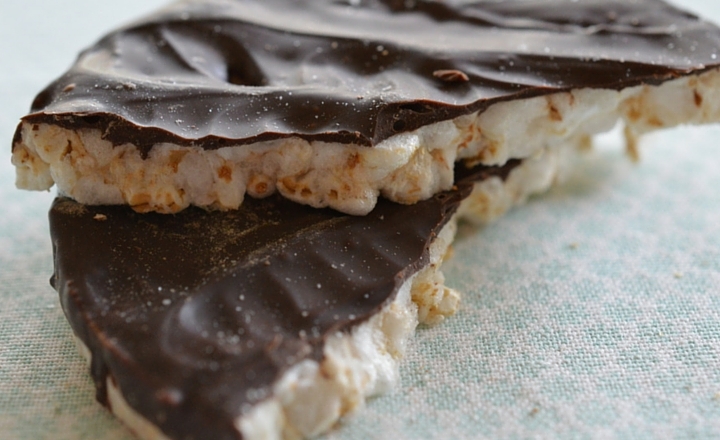 Their own-label dark chocolate covered rice cakes are great – three in a pack so no risk of a) going chewy (the rice cake death) or b) me eating 10 in one day! The dark chocolate is quite generous and a decent quality which means I wasn’t tempted to eat more than one at a time because it made my brain think I’d had a chocolate bar. Itsu have recently opened a branch in Manchester’s Spinningfields offering lunchtime sushi and soups for workers in the area, and an array of snacks like the ones above. This box of treats has certainly got us out of a snacking rut so I’ll be popping in to stock up when we’re in town. Thanks Itsu!